Staple line reinforcement (SLR) is a commonly used technique during laparoscopic sleeve gastrectomy (SG) for severe obesity. There remains controversy over the potential benefit or risk associated with SLR. There are currently no consensus recommendations about SLR use. Its use is surgeon-dependent and remains controversial. To determine the impact of staple line reinforcement on staple line leak and bleeding rates after sleeve gastrectomy. 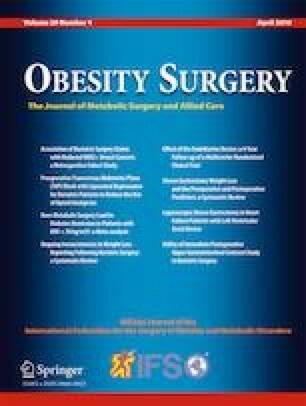 Using the Metabolic and Bariatric Surgery Quality Improvement Program Participant User File (MBSQIP-PUF) database, we identified patients who had a SG in 2015 and 2016. SLR utilization status was used to create two cohorts. An unmatched cohort analysis was performed, and the outcomes were compared. A propensity score and case–control matched cohort analysis were then performed, and the outcomes were compared. Statistical analysis was performed with SPSS and SAS. Of the 189,173 SG cases identified, SLR utilization was noted in 127,521 (67.4%). In the unmatched analysis, bleeding and reoperation were significantly higher in the cohort without SLR utilization. In both propensity score and case–control matched analysis, bleeding and reoperation remained significantly higher in the cohort without SLR utilization. There was no difference in mortality and staple line leak rates between the cohorts. SLR significantly reduces bleeding and reoperation rates following SG and has no deleterious impact on staple line leak rate. While further prospective studies factoring in the SLR method and staple characteristics are needed, this large database analysis supports the use of routine SLR during SG to reduce the risk of perioperative bleeding and reoperation. This article does not contain any studies with human participants or animals performed by any of the authors. This is a retrospective review of a nationally available, clinical database containing only deidentified data. The dataset does not have any variables that would allow for patient, surgeon, or institution identification. For this type of study, neither an institutional review board approval nor formal consent was required.